Although they are known as ferocious hunters, mother alligators are very caring toward their young in the beginning stages of their lives. After spending 9-10 weeks protecting her eggs, she stays with the hatchlings for at least the first year of their lives. Here, we’ll go through the stages of these defensive creatures and learn more about their life cycle. Around late June and early July, the mother alligator typically lays about 35 eggs in a nest made of mud, sticks and other plant matter. 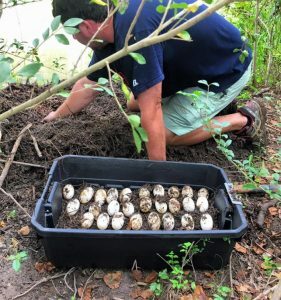 The nests are usually about three feet tall and six feet in diameter, located in swampy areas like you’ll see if you stroll down our boardwalk. During the 65-day incubation period, the mother guards the nest to protect her young. Just as the alligators are ready to hatch, they alert their mother by making high-pitched noises from inside of the egg. She will then either carry her young into the water on her back or release the hatchlings by opening the nest into the water. *Interesting fact: The temperature of the nest determines whether the eggs develop into males or females. 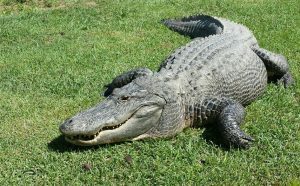 Cooler temperatures between 82 and 86 degrees produce females; moderate temperatures between 82 and 90 degrees will produce a litter of some males and some females; and warm temperatures between 90 and 93 degrees will produce male alligators. 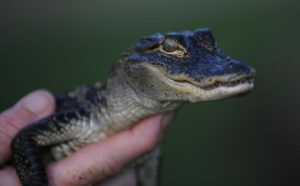 During the first years of the alligator’s life, they learn to eat small animals in and near the water. They typically feed on insects, snails, worms, birds and small fish – everything is on the menu when you’re an opportunistic alligator. They stay close to their mother for at least the first year of their lives to be protected from a variety of predators including raccoons, otters, wading birds and fish. Very few hatchlings will actually survive to adulthood, only about 2-3 our of an average clutch of 35 eggs. Alligators can remain with their mother for up to three years before seeking out their own territories. Once the young alligators reach four feet in length, they’re considered virtually invulnerable in the wild. Here in Alabama, they can grow upwards of about 12 inches per year. That growth rate will slow once sexual maturity is reached, usually when they are around 6-7 feet in length. When the weather gets warm in mid-April through the end of May, alligators begin their search for potential mates. A male alligator starts this complex mating ritual by announcing his presence, making low bellowing sounds and sending vibrations through the water. Once a female has chosen her mate, the male scares off other suitors and then pushes the female to make his intentions known. After the pair mate, the female retreats to build her nest, while the male alligator repeats these mating rituals. Females will actually mate with multiple males, therefore having multiple fathers in that one clutch of eggs. 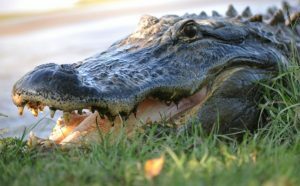 Typically, the average alligator’s lifespan is 50 years; however, the oldest on record is in its early 70s. 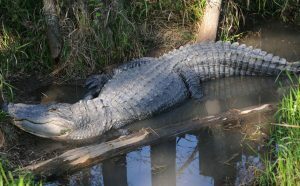 While alligators of 10 feet can have as much as 1,800 pounds of bite, alligators can grow to a maximum length of 14 feet. Here at Alligator Alley, we’re home to Captain Crunch, a 13-foot, 8-inch long alligator weighing over 800 pounds and holding a world record for his bite strength of 2,982 pounds! 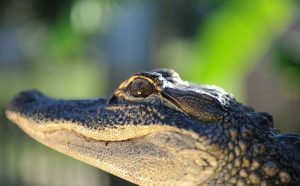 To learn more about the life of an alligator, come visit us in February for a tour of the farm!